As a small business owner, you might be shying away from paid online advertising in fear of it taking a large chunk out of your budget. Facebook, however, provides a business tool for companies of every size and industry, with no minimum on how much ad dollars you need to spend to get in the game. According to Hubspot, Facebook marketing can “help you get found more easily in search, create a community around your business, promote the content you create and develop a strong brand identity.” But let’s not forget about one of the most intriguing reasons to advertise on Facebook: lead generation. Facebook ads are a great way to build a database of people who are interested in what you offer, because the reach and targeting options are exceptional. So, how can you use Facebook ads to attract new leads and turn them into paying customers? The most effective way to drive new customers using Facebook Ads is to offer people something of value. Facebook Ads require you to provide an incentive to get people to click. They are most likely not thinking of buying something when they see your Ad on Facebook, so you have to be creative and efficient in grabbing their attention. Here are 5 example of small businesses who created successful Facebook Ads. 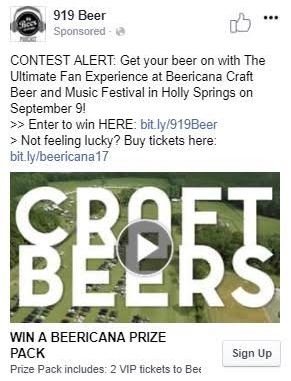 Beericana, a craft beer and music festival, wanted to launch a Facebook Ads campaign to bring more beer enthusiasts to the North Carolina event. They needed a quick and inexpensive way to sell more tickets, grow their email database and raise awareness for the festival. In order to do all of the above, Beericana created a special giveaway that could be promoted through the Facebook ad (see below). To enter the giveaway, people simply had to input their email address and phone number. After signing up, these subscribers received targeted emails promoting the festival tickets. Pro Tip: The creative accompanying the ad was a highlight video from the previous year’s Beericana instead of a static graphic promoting the prize package. Videos have a higher conversion rate than photos and, in this case, the audience was really able to visualize the event. Their goal was to gain a more predictable, steady way to target ideal customers and get them onto the email list (the online channel with the highest engagement). They also didn’t have a massive budget, so the campaign started with $20/day. 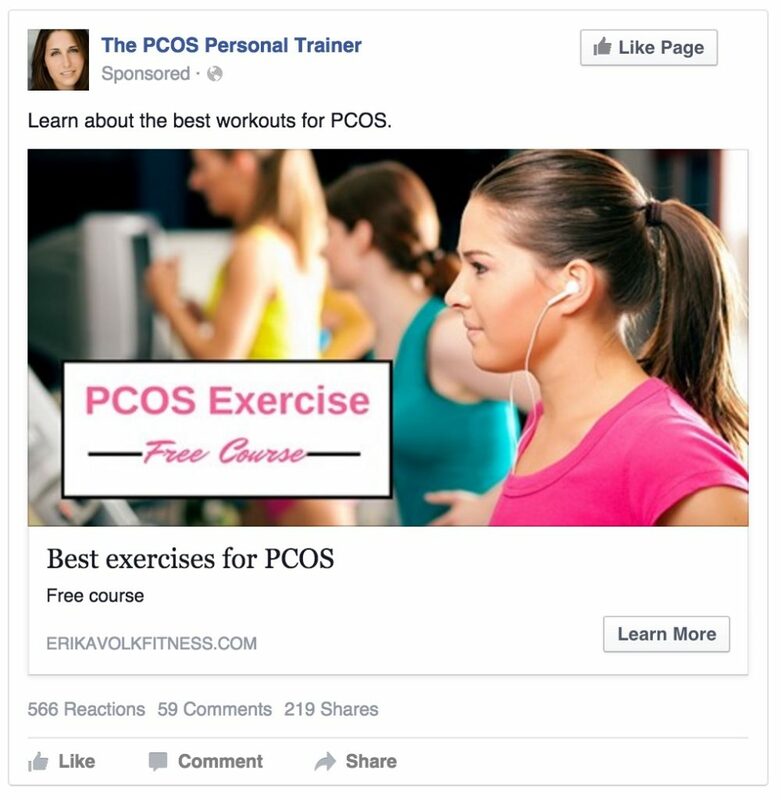 Erika Volk Fitness created a Facebook ad promoting a free email course. Clicking on the ad brought you to a landing page where you could sign up to join the course (which is an email series). These emails were also used to upsell the premium workout routines and plans. - Extremely low cost per conversion (cost per visitor to her landing page): 6 cents. Pro Tip: The creative was a simple stock photo with overlaid copy that clearly stated the offer. The more your visual conveys, the higher the chance it will catch your audience’s eye and lead to a conversion. 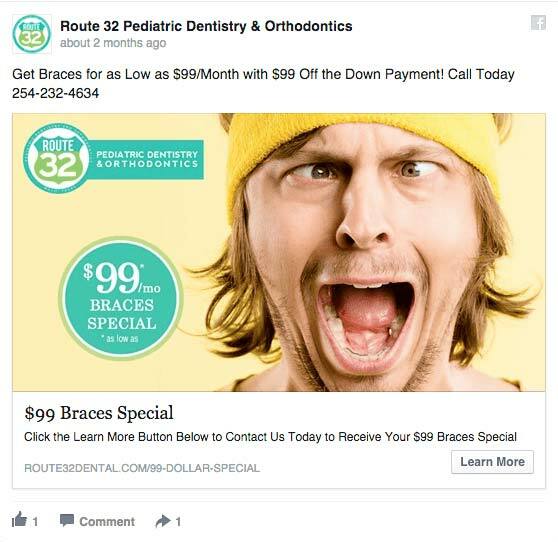 In order to acquire new customers, dentist office Route 32 created an ad that centered on a special discount. Especially when it comes to something as unpleasant as dentist appointments, Route 32 needed to show their services in a positive light. They used a fun and engaging image, while backing it up with a solid offer that takes something complex like paying for braces and making it easy to understand with a discount of $99/month. Pro Tip: As the Route 32 ad demonstrates, any industry can advertise on Facebook, not only “fun” companies. As long as you are targeting the right audience and using appropriate ad creative and copy, your business can be successful at generating leads on Facebook. 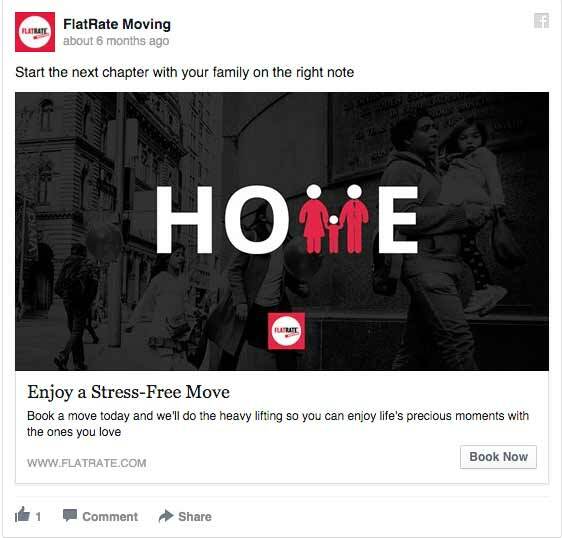 FlatRate Moving used Facebook Ads to increase their bookings, directly through their online ad. They honed in on the value they bring to their customers to convey in the ad. More specifically, FlatRate Moving wants to remove the stress associated with moving by having them deal with all the negative aspects. The entire ad reinforces this message, calling out to their readers who are about to experience the trouble of moving. Pro Tip: When it comes to advertising online, sometimes it’s less about discounts and deals and more about how you can make a real difference for someone with your business. Use that story, maybe even appeal to their emotions, in order to convince a reader they need you. Services can be difficult to sell because you’re talking about intangibles that can’t be seen or held. Take Redmaster’s lead and show your audience the finished product. Let the end results speak for themselves! 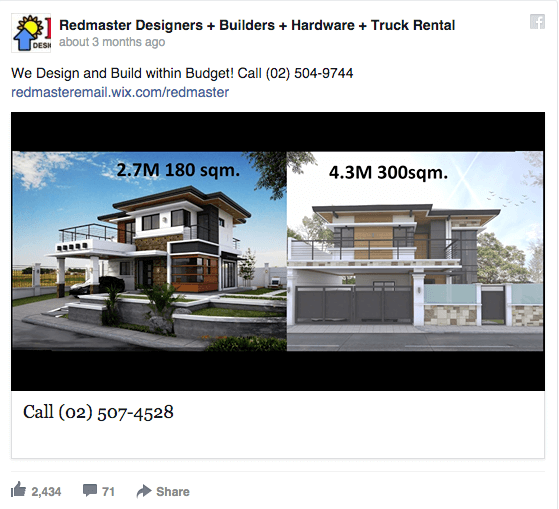 People scrolling through Facebook can immediately decide whether this is something they need or want and, in this case, pick up the phone and give Redmaster Designers a call. Pro Tip: Leading with social proof in your Facebook ads comes in many forms, you could share testimonials, case studies, before-and-afters, press and more to show (not tell) customers why you matter. With every one of these ads, you’ll want to make sure it’s clear to the reader where you are sending them. If they think they’re clicking into a blog post and find themselves needing to fill out a form, they could get confused or frustrated. Use the right copy to make it clear what they are getting by clicking and/or filling out their information. You want this first impression of your business to be as positive as possible. As per Facebook, “Once you’ve captured awareness and created demand for your business, encourage potential customers to sign up for more information, spend time in your app or on your website or visit your store -- actions that signal they may make a purchase. Understanding which groups of people are thinking about purchasing helps you reconnect with those people later to encourage them to complete the transaction, so you can boost sales.” Now head on over to Facebook Ads to get your ad in front of the world.